The ISU livestock crush margin app is a web based app that can be accessed through the link above by phone, tablet or computer, or by saving the URL on your phone. Internet access is needed to use the app and access futures market prices used in the app. The app will help you with price risk management by calculating a margin that could be hedged for fed cattle or market hogs placed on feed at a future date. It uses basis adjusted futures prices from the previous trading day’s close to calculate a fed cattle finishing margin (Live Cattle – Feeder Cattle – Corn) or a market hog finishing margin (Lean Hogs – Weaned Pig – Corn – Soybean Meal). 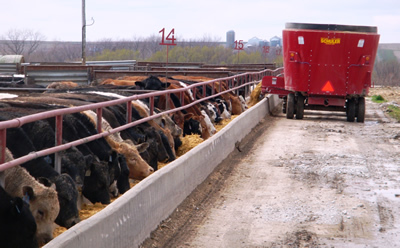 To use, select either cattle or hogs and the date they will go on feed, and the app will use the futures price and Iowa historical basis to calculate the potential margin above the cost of the feeder and estimated partial feed cost. This app complements the ISU livestock crush margin that is calculated and posted every Wednesday. That app allows users to select placement day and adjust input prices or basis if they choose. For additional information or questions contact Russ Euken ISU Extension Livestock Specialist reuken@iastate.edu or 641-923-2856, or Lee Schulz ISU Extension Livestock Economist lschulz@iastate.edu or 515-294-3356.